Forty years ago on October 6th 1974, Emerson Fittipaldi, the father of Brazilian motorsport, brought home McLaren’s first-ever world championship trophy. Jules Bianchi’s family says the driver is suffering from a brain injury after a racing accident at the Japanese Grand Prix. Take a look at our new power unit currently in development for the 2015 Formula One (F1) World Championship. The whole team is concentrating on development, getting ready for the forthcoming start of F1 participation in 6 months time. Stay tuned for further updates. Race fans are congregating in Sochi, Russia to witness the first competition at the world’s newest Formula One track. Weaving through the Olympic Village used by athletes this past February, the track is described by drivers as fast and technical, ensuring an exciting race this upcoming weekend. RT’s Neil Harvey is in Sochi to take a look. Sochi is gearing up for its second major sporting event of the year, as the Russian resort city hosts the country’s very first Formula One Grand Prix this week. But for some people there, it’s a mixed blessing. F1 will court further controversy this weekend when Russian president Vladimir Putin oversees the inaugural Grand Prix at Sochi. Amid the Ukraine crisis, the MH17 atrocity and tough anti-Russian sanctions imposed by Europe and the US, there had already been calls for Formula One to cancel its first race in the country. But mere days after the Japanese Grand Prix, F1 is now busily setting up at the new Sochi Autodrom, based around the central venue of the Winter Olympic Games earlier this year. The sanctions do not affect us and what we are doing is not illegal. Having skipped Japan, F1 supremo Bernie Ecclestone will be at Sochi this weekend, having travelled to the former Soviet state Azerbaijan on Tuesday to unveil the sport’s next destination, the 2016 European Grand Prix at Baku. The Russian PM Vladimir Putin seems to be looking to become the fastest politician in the world. His need for speed was fulfilled in St. Petersburg, where he took to the track on four wheels. He reached speeds of up to 240 km/h (150 mph) in a Formula One car, after a full safety rundown from trained professionals. This sudden interest in racing comes after Russia’s successful bid to hold an F1 event after the Sochi Olympics in 2014. A deal for a Russia’s first Grand Prix in Sochi was signed three weeks ago. Formula One group CEO Bernie Ecclestone and Azad Rahimov, Azerbaijan’s Minister of Youth and Sport, unveiled the layout of the exciting new Hermann Tilke-designed Baku European Grand Prix street circuit at a special press event in Baku, Azerbaijan on Tuesday. The Baku European Grand Prix will take place in 2016 and Tuesday’s event saw Mr Ecclestone and Minister Rahimov presenting the layout of the street circuit that will see Formula One cars racing through the streets of Baku on F1’s newest track. 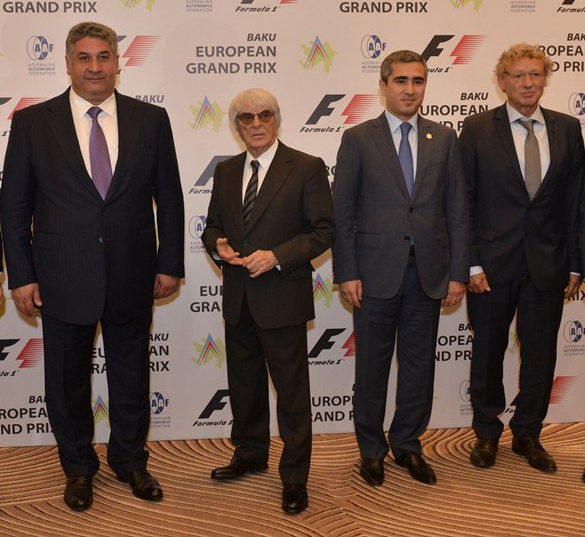 Azad Rahimov: “This is a very exciting milestone for everybody involved in the Baku European Grand Prix and I would like to thank Mr Ecclestone for taking the time out of his very busy schedule to come and help us unveil the newest F1 circuit to join the world’s most exciting sport. “We have been working very closely on the circuit layout with Hermann Tilke and his team since early 2013. Our brief to Tilke Engineering was simple – create a circuit that is unique, one that will help the Grand Prix in Baku quickly establish itself as one of the most exciting, thrilling venues on the F1 calendar, and one that the fans and teams alike are excited about. Most importantly, we wanted a track that would showcase the best of Baku, our capital city, and I am delighted that the circuit the F1 teams will race on in 2016 has achieved exactly that aim. Hermann Tilke, CEO Tilke Engineering: “I am absolutely thrilled about the Baku European Grand Prix project and delighted we can now unveil the track design. We have created a challenging street circuit, in terms of engineering and design, and one that thrives on Baku’s very attractive urban atmosphere and its great combination of history and 21st century style. The historic city centre, the beautiful seaside promenade and the impressive government house all combine to provide the perfect backdrop for a spectacular new track. Anar Alakbarov, Executive Director of the Heydar Aliyev Foundation and the president of Azerbaijan Automobile Federation was also present at today’s event. Mr Alakbarov said: “Formula One, the world’s fastest motorsport championship is already very popular in Azerbaijan as a spectator sport. We are deeply honoured by the privilege awarded to us by the Formula One family in welcoming us to their party and enabling us to host the Baku European Grand Prix in 2016.